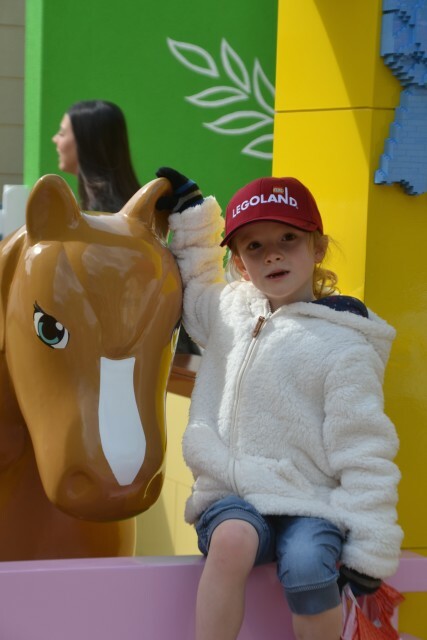 We love all things LEGO in this house and my girls adore LEGO Friends so we were very excited to be invited to see the brand new LEGO Friends area at LEGOLAND Windsor. The old LEGO City area has been beautifully transformed into Heartlake City. Heartlake City has lots of great things to see including the very cool Olivia’s House complete with interactive LEGO and other surprises. The kitchen has a sink with a screen you can touch to wash the dishes, dressing up that appears in a mirror in front of you and lots more. We had a great time trying everything out. Even the train has been updated into the Heartlake City Express for a lovely, scenic train ride around the park. We loved Heartlake Cafe for delicious coffee and cake, they also serve sandwiches and a large variety of drinks. Heartlake City also has an Ice Cream Parlour, Popcorn Shop and Shopping Mall. We thought the whole area was really well done. We didn’t get chance to look at the The Heartlake News Van but children can pretend to be news reporters inside it. From the photos I’ve seen it looks like great fun and is definitely something we’ll be trying next time. We did watch the brand new live show – LEGO Friends to the Rescue at the Heartlake Harbour Arena which was very entertaining. I do love the ethos behind the LEGO Friends. My 4 year old decided that when she’s grown up she wants to be a LEGO Friend with her friends from school. The show really enthused my girls about LEGO Friends and they were both desperate to add to their collection in the shop on the way home. 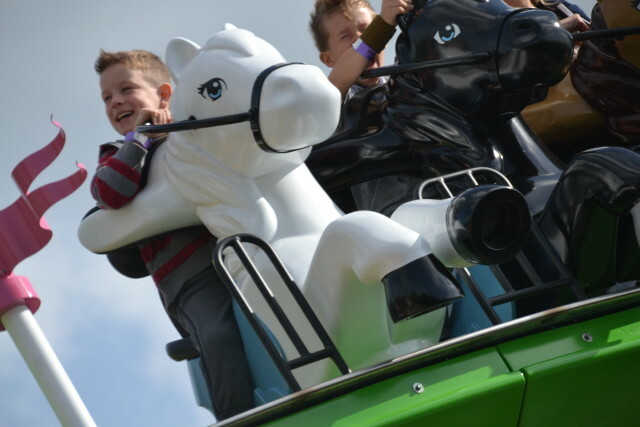 Unfortunately both my girls were too small for the BRAND NEW ride, Mia’s riding Adventure, but my 8 year old son couldn’t wait to have a go. You can see from his smile in the photo how much he loved it. 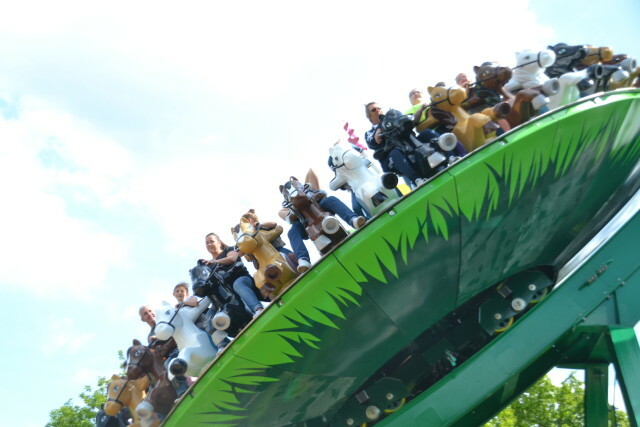 I only have close up photos, but the ride is on a half loop and spins as it goes up and down. According to Zak, it was awesome! 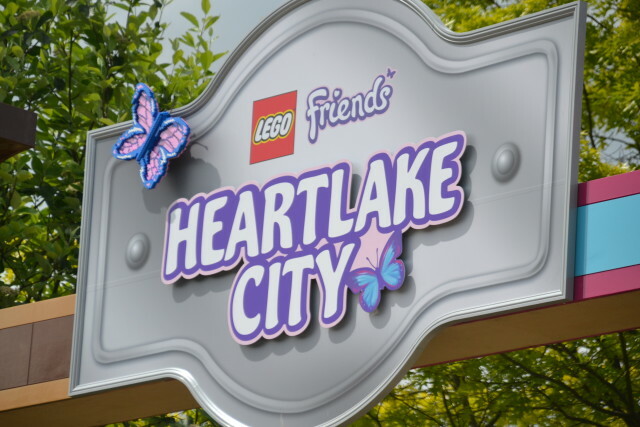 We would definitely recommend Heartlake City as as must visit part of LEGOLAND, and not just for girls. 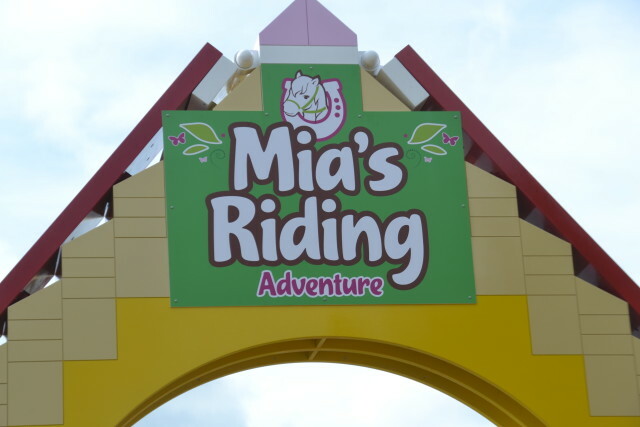 Zak went on Mia’s riding Adventure three times and would have gone on more if we’d had the time. My 8 year old and daredevil 4 year old are big fans of The Dragon, Pirate Falls , Vikings’ River Splash and the Jolly Rocker, while my slightly less roller coaster happy 6 year old enjoyed The Dragons Apprentice and Fairy Take Brook. Everyone absolute LOVED LEGO City Driving School. It was Sydney’s first time in the big cars and she was hilarious driving around the track at her own pace. 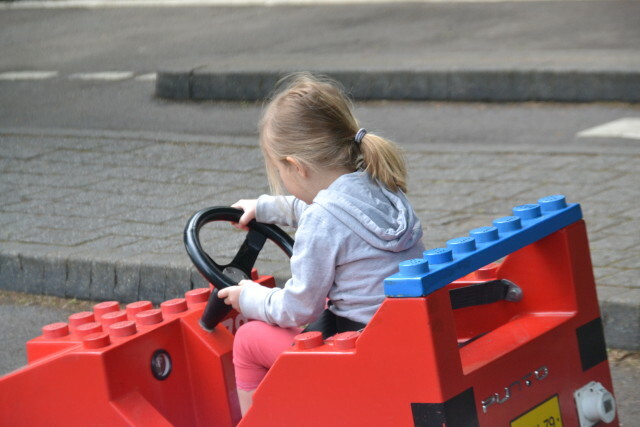 Little Hannah was thrilled to be big enough to drive the smaller cars and was very proud of her new found driving skills. We always like to spend some time in Miniland looking at the models, Zak was thrilled to spot Kennedy Space Center which we visited in the Easter holidays, especially the model of the soft play area which we hadn’t noticed on previous visits to LEGOLAND. 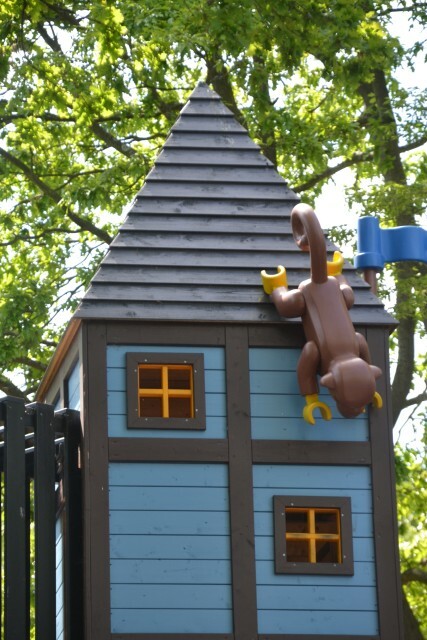 The children also loved playing in the Pirate themed play area, Castaway Camp which wasn’t open on our last visit. Zak loved the bars, slides and many, many things to climb on. It was a great place for the grown-ups to rest and reboot while the children happily explored and played together. All in all we had a fantastic day at LEGOLAND and can’t wait to go back. We were kindly given refill drinks bottles which are £7.50 each or 2 for £12. The children loved carrying these around their necks and they saved us a fortune buying drinks as it ended up being quite a warm day. There were plenty of refill stations around the park so refilling whenever we needed was very easy. To LEGOLAND for our lovely press packs, fast passes and tickets for the day. 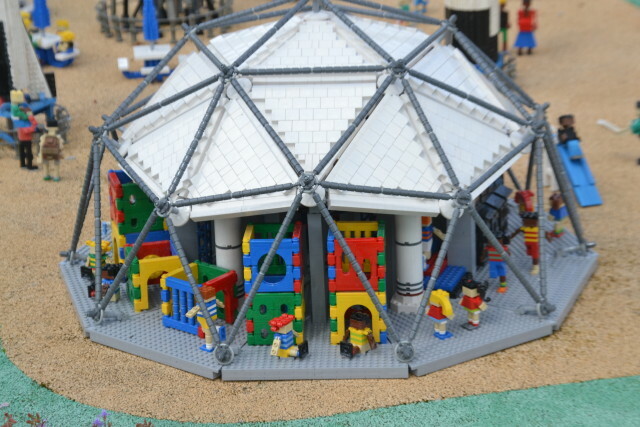 Wow, we love Legoland and were regular visitors a few years back when we had Merlin passes but it’s been a while since our last visit and it looks like things have changed a lot! Thanks very much for sharing, I think we need to make a return visit soon! Cass@frugalfamily recently posted..#BeABlogger – How to start your own blog in seven simple steps…. Oh my goodness! My daughter would absolutely LOVE THIS!